Yoshihito, Prince Katsura (桂宮宜仁親王, Katsura-no-miya Yoshihito Shinnō, 11 February 1948 – 8 June 2014) was a member of the Imperial House of Japan and the second son of Takahito, Prince Mikasa and Yuriko, Princess Mikasa. He was a first cousin of Emperor Akihito. Originally known as Prince Yoshihito of Mikasa, he received the title Prince Katsura (Katsura-no-miya) and authorization to start a new branch of the Imperial Family on 1 January 1988 at age 39. He died of a heart attack on 8 June 2014, aged 66. 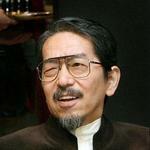 The Prince graduated from the Department of Political Studies in the Faculty of Law of Gakushuin University in 1971. Between 1971 and 1973 he studied at the Graduate School of the Australian National University, in Canberra, Australia. After his return to Japan, he worked as an administrator at the Japan Broadcasting Corporation from 1974 to 1985. In 1982, the Prince returned to Australia as part of the Japanese delegation in honor of the tenth anniversary of the Australia-Japan Society. He also visited New Zealand to strengthen ties and friendly diplomatic relations. Despite his disabilities following a series of strokes in 1988, he took an active role in public service, and appeared regularly at award ceremonies, diplomatic events, and as President of various charity organizations. In July 1997, Prince Katsura again visited Australia, to help promote an exhibition of the traditional sport of sumo, with exhibition matches held in Sydney and Melbourne. Prince Katsura suffered a series of strokes in May 1988 and had surgery for acute subdural hematoma. Finally he became paralyzed from the waist down, forcing him to use a wheelchair. Despite this, he remained active in public life and appeared regularly at award ceremonies, diplomatic events, and as president of various charity organizations. However, he had been hospitalized on and off since 2008 due to sepsis. In early 2014, the Prince was diagnosed with an unspecified illness that affected and deteriorated his heart. In the early morning hours of 8 June 2014, he suffered a massive heart attack, and despite best efforts he was pronounced dead at 10:50 AM local time. He was 66 years old. On 17 June 2014, the main funeral service for Prince Katsura, called "Renso no Gi", was held at Toshimagaoka Imperial Cemetery in Tokyo. About 560 dignitaries including the members of Imperial Family attended the funeral. Prince and Princess Mikasa, Prince Katsura's parents, acted out the duty of chief mourners and his niece, Princess Akiko, hosted the ceremony. Prince Katsura never married and left no legitimate children. As his brothers only had daughters themselves, his death marked the end of his father's branch of the Imperial Family and also his own branch. As a result, the number of households in the Imperial family dropped to four, excluding those led by Emperor Akihito and Crown Prince Naruhito. He was survived by his parents. President of the Japan Australia New Zealand Society, Inc.
^ a b "Emperor's cousin, Prince Katsura, dies at 66". Japan Today. Retrieved 14 May 2015. ^ a b "Prince Yoshihito died". imperialfamilyjapan.wordpress.com. Retrieved 14 May 2015. ^ "Japan's prince Katsura, cousin of Emperor Akihito, dies at 66". The Straits Times. Retrieved 14 May 2015. ^ "Prince Katsura, cousin of Emperor Akihito, dies at 66". The Japan Times. Retrieved 14 May 2015. ^ "Funeral held for Prince Katsura". The Japan Times. Retrieved 14 May 2015. ^ "Funeral held for emperor's cousin, Prince Katsura". Japan Today. Retrieved 14 May 2015. This page is based on the Wikipedia article Yoshihito, Prince Katsura; it is used under the Creative Commons Attribution-ShareAlike 3.0 Unported License (CC-BY-SA). You may redistribute it, verbatim or modified, providing that you comply with the terms of the CC-BY-SA.